The eagle has landed. Or at least it does, each winter around the shores of Grand Lake. From mid-December to March, the lake area, specifically the area just below the Grand River Dam Authority’s Pensacola Dam, becomes a haven for both the American Bald Eagle and the Golden Eagle. In fact, GRDA even designated the area “Eagle Pass” and installed signage to help promote the area to the public. To access Eagle Pass, follow Broadway Avenue south out of Langley, Oklahoma to N4475 Rd (the road that runs below Pensacola Dam). Go east on N4475 until you cross the bridge, then turn right (south) onto the dirt road and follow it around to the eagle viewing areas. The location is a quiet spot for viewing the majestic birds that are most active very early in the morning. It is not surprising to see the American Bald Eagle (Hailaeetus leucocephalus) in the area; after all, it is the only eagle unique to North America. The American Bald Eagle’s range extends across most of the continent from Northern Canada and Alaska all the way down to northern Mexico. The eagles, both males and females, are recognizable by their blackish-brown backs and breasts with yellow feet and bills. They also have white heads, necks and tails. The Golden Eagle (Aquila chrysaetos), has a much broader range, and can be found not only in North America (and below Pensacola Dam) but also in Europe, North Africa and Asia. These birds are dark brown and the plumage on their heads and necks is a lighter golden-brown. Typically their feathers go all the way to their toes, while the American Bald Eagle has more leg showing. Bald eagles will hunt small fish, often snatching them off the surface of the water or even stealing them from other birds. The best time to watch the birds feeding is early in the morning. GRDA’s Eagle Pass area is just one of many locations where eagle watching is a popular winter past-time. The birds can also be found below GRDA’s Robert S. Kerr Dam as well as at many other dams and lakes across the state. Hanging out at Eagle Pass … This bald eagle is one of many that was spotted near “Eagle Pass” below GRDA’s Pensacola Dam. 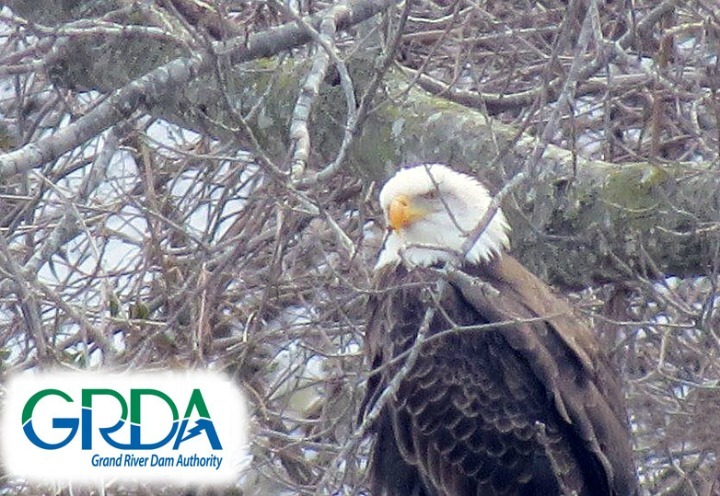 Mid-December through March is prime eagle viewing season below hydroelectric facilities like GRDA’s Pensacola and Kerr dams.